The thought occured to me that I've looked at and commented on the flower pictures that others have posted but I haven't posted many of the things I'm growing these days. So here are some of my orchids. They are a mix of things I've had and bloomed for a while and things I've just recently aquired. Its also a good way for the members to do a check list with the paphs they have in flower. And a bunch of Cymbidiums, and Dendrobiums. I just noticed this morning that 9 out of my 10 Dendrobum tetragonum var melaleucaphilums are in spike! They're all so beautiful Kevin. I can get over the Masd Kara's Delight x Red Star. I've never seen anything like it. And Paph Sally Berndt...breathtaking! There's STILL ONE PHOTO MISSING ...............! I got the Masdevallia from Mt Beenak orchids at the 2006 Melbourne Flower and Garden Show, so that's been about a year and 2 months ago. In that time it has bloomed 3 times (including it being in bloom when I bought it); this blooming was the thrid. I don't think I'm ready to divide it yet. It's still only in a 75cm pot (I think). I'm looking forward to judging tomorrow. I love the show judging. 75cm pot? OH MY GOD IT"S A MONSTER!!!!! LOL.......just kidding.......I know you mean 75mm. Actually it must be hard to get used to the metric system. Yes I love the judging as well, I really look forward to the first show of the year. So I will see you there, hopefully there's a big turnout. I only have one mini catt in flower so I won't have any plants there but it will be great to attend. Beautiful pics Kevin, I must say you are the King of Paphs!!! I think i may have to get some Coelogyne those are amazing flowers. That Phrag is really good too, the top petal is even twisting, is that a good thing? or would it get more points for being symetrical? The twising of the dorsal sepal of the Phrag is not abnormal, but the less twisting the more points if it were being judged. Many longifoliums have been awarded in the American system over the years so the standards are fairly high. My longifolium would probably not be considered for an award. Kevin, you have beautiful blooms there. Thanks for sharing. The Paph Sally Bernt is very beautiful. I also like the Paph. insigne var. albo marginata. Great plants. Is the twisting that tom mentioned going to happen with all of the flowers? Or is it just that particular flower? I still think it is lovely. Last edited by brookn; 05-24-2007 at 02:24 PM. Sally Berndt is a hybrid between Paph sukhakulii and Paph Greyi (Paph Greyi = Paph goderfoyae x Paph niveum). All of these round white Paphs like niveum, godefroyae, bellatulum, and concolor are in a section of the Paphs called the Brachypetalum section (or Brachys, infomally). I have never seen a suk-Brachy cross I did not like. Paph Niverose (suk x niveum) is another one, very easy to bloom and beautiful flowers. This particular Sally Berndt has some problems with its form but that may improve on the next blooming. I'm very happy with the markings though. I really like the round type ones. I have actually had my eye on a paph belletulum. It is just really nice on the eyes. kmarch: you are determined get 'sick' people 'sicker', psychologically speaking. I like gold flowers and the Masdavallia looks great. Please, tell me more about the Masdevallia cross! Hubby and I ooooh'd and aaaah'd over the pics. Good grower for outdoors in Central FL? Any fragrance to it? Love the Paphs, too, but have killed a few of those, so afraid to get any more!! Masdevallias come mostly from the Andes mountains and other cool-ish areas in South America. They like cooler temps and lots of humidity and moisture. I live in Melbourne Australia where we have cool (down to 5-8C), wet winters and hot (up to 35+C), dry summers. I grow my Masdevallias in sphagnum moss which is kept constantly moist. They do great in autumn and winter, ok in spring, but they don't take the hot dry summers too well. For a good culture sheet on Masdevallias go to www.aos.org Give the sulture sheet a good read and see if you can provide what they need. If you can, give them a try! Just today while I was watering I noticed some exciting things just starting to come into bud: Paph Albion and Paph Amarantine (liemianum x moquetteanum). It's great to have things just starting to bud! It's nice to have something to look forward to! Exquisite. The 3rd photo reminds me of a ballerina, so graceful. The madevallia is gorgeous, and those mottled leaves are so pretty. Nice growing. I hope mine will look half as good someday. Kevin, I've been meaning to post this photo of one of my pots that I never noticed what the flowers were until very recently. I've had this pot for years. Thought of you when I realized what I was looking at! Nice, sandra, I like it! They look like Paph fairrieanum. about 3 weeks ago I was watching a DYI show and they put up wall paper with a Paph design. I squealed! "Loooooookie! Paph wall paper!" Here's a few of my recent blooms. very nice Kevin I like the Coel. Linda Buckley I will have to try and see the orchid doctor about that one. Real beauties, kmarch. The Coelogynes are stunning. ...and I should add, really very easy to grow. Thanks! Beautiful Kevin! I'm really excited about my Coelogynes... and that Paph! There goes my wish list again!! call a natural "earthy" beauty about them that I seen in very few other orchid genera. Tobi, I agree. I have 2 (well now 3 thanks to division) and while they have yet to bloom in my ownership (~3 months), they are among my favorites. I really like their foliage! Beautiful pics, Kevin. I'm loving the two yellow/green paphs in the first post. I've been eyeing yellow paphs in books and online lately, I think I may need to find one to add the the orchid room. Too pretty! wonderful pics kevin I would have replyed sooner but i had a hard time finding my eyes after they poped out from seeing the awesome pics. Kevin, please let me know the flower size of Masd Kara's Delight x Red Star. In the pic. it appears to be almost a miniature. I think it is delightful, as are the rest of the pics. I'm glad you updated this thread, I might have missed it otherwise... you have some really wonderful blooms and photos! The Paph tonsum in this last set is a great one. Well, this photo of Paph. insigne albo-marginatum prompted me to do a quick bit of research. I see that Philip Cribb doesn't recognize it as a variety, just as a cultivar... but it was recognized as a variety in the 19th Century. If any of you are interested in orchid history, I thought this might be worth sharing. Here is a plate by Fitch from the 1897 edition of the renown "Orchid Album". The Orchid Album, Comprising Coloured Figures and Descriptions of New, Rare, and Beautiful Orchidaceous Plants, Conducted by Robert Warner and Henry Williams, with coloured figures by John Nugent Fitch. Volume XI, Published by BS Williams and Son, London, Victoria and Paradise Nurseries, Upper Holloway, N., MDCCCXCVIII. I LOVE the absurd length of Victorian book titles. Last edited by gore42; 07-25-2007 at 09:33 PM. Kevin, I just can't get over the Paph. Javapink from your first post. So glad you reposted!! Matthew, where do you get those beautiful plates? They are stunning. (I am in the book business so am always curious about beautiful books). Thanks everyone for the kind posts. I'm glad you enjoyed the pics and even more pleased that they've sparked your interest in and excitement over growing! If you like the tonsum, you might also consider Paph Olivia (tonsum x niveum). It's a beautiful flower. notice how it keeps the tonsum shape but takes on the niveum colouration. Wow! I don't have an Olivia yet but am looking out for one. Thanks Tobi. Two of the many things I like most about them are that they come from such a diverse range of climates that there are warm, intermediate, and cool growers. Whatever your conditions, there's a Coelogyne for you! They also come in such a variety of sizes, styles, and colours, from the small, eccentric, and charming to the large and dramatic, in oranges, browns, greens, yellows, and whites. So much variety! The natural spread of the Kara's Delight cross is approximately 2.5cm x 9cm. When most orchid folks I know refer to "miniatures" they're referring to the plant size. Many Masdevallias then fit into that category. From the top of the pot to the highest leaf tip is only about 15cm. This little guy is growing pretty well now, putting up several new shoots. I'm hoping for a showbench-quality blooming from hin this year. I've only ever found one mention of the albo-marginata variety of insigne and as you've mentioned Cribb reduces it to a cultivar, as he does pretty much all of the insigne varieties. According to the brief descriptions Cribb offers though i actually believe this to be synonomous with insigne var. sanderianum (not to be confused with sanderae as sanderae has speckles on the dorsal whereas sanderianum does not). I have not researched which description, sanderianum or albo-marginatum was published first though. Do you know? Even if taxonomists question the status of these varieties, it would be interesting to know about them. When I attend shows I see a fair bit of confusion over the varieties. Regarding the copyright issue, as I understand it providing sources (as in a bibliographic entry for text not exceeding 10% of the whole) and/or links back to the source material is enough to satisfy the copyright acknowledgement requirement. As long as you give credit to the author and/or photographer, I think you are safe. You are not using it as one of your images, or using it for profit, so therefore it is generally OK to use it for reference or reviewing purposes. Being in the medical profession I come accross this every day, nd fairly well versed in it, and for the way you are presenting it, as mentioned by myself and Kevin, there shouldn't be an issue, but it doesn't hurt to be cautious. I have been in contact with Fred, and you can put it back up with no problem. In fact, I am keen to see it myself. For purposes of comparison, here are a few more plates from various other Orchid Album volumes. 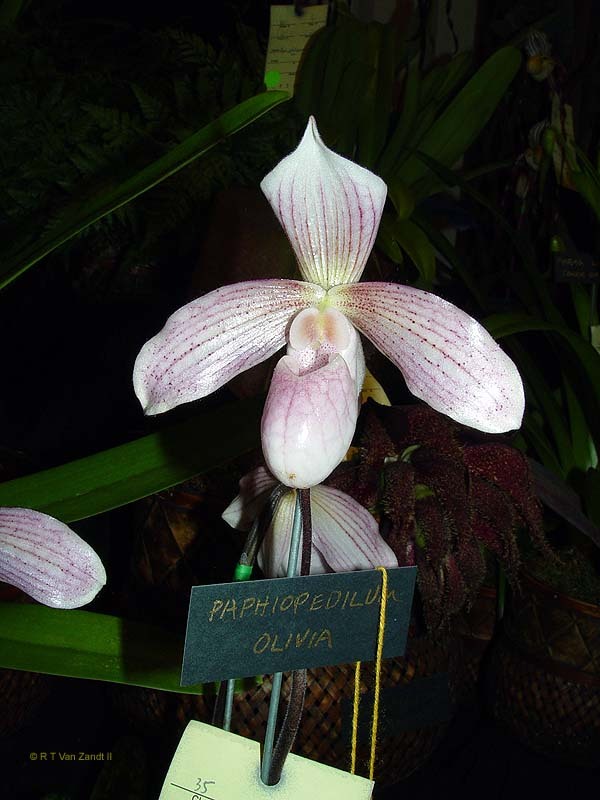 First, from volume IV, is the type form of Paph. insigne. Notice that the dorsal sepal has a white margin, but that the spots overlap onto the margin, whereas the albo-marginatum has no spots on the margin. Again, these varieties are no longer recognized as valid taxonomic classes, but rather as cultivars. Still, I love to see the amount of variation that can be found within a single species... or at least, could be found in history. BTW, THANKS to the Denver Botanic Gardens Library for allowing me to handle and photograph these valuable old books. They have a great collection... hopefully I'll have a chance to spend more time with it soon! Last edited by gore42; 07-26-2007 at 12:30 AM. Matthew, thanks for sharing these fantastic botanical drawings and for helping ot clarify the albo marginatum issue. It would seen then that my insigne is not albo marginatum at all but rather var. sanderianum, which according to Phillip Cribb has no markings or spots at all. Of course, even this is no longer recognized at a genuine variety, but is suggested as a cultivar. It's nonetheless fascinating, as you mentioned, to be aquainted wiht some of the varieties of this great species. Pterostylus are some of my favorite Aussie natives. I even grew and bloomed a few in the US before I moved to Australia. Now that I'm growing them closer to their native environment they grow much more vigorously and rapidly. I've had the pot of Pterostylus curta for 3 years now and I just recently bought the pot of concinna. It's interesting how different thr flower is on this blooming. Compare it to last year's bloom. There's a lot more red in the lip this year. Here's my 2 most recent Paph blooms. The first three are Paph Albion. I posted pics of the Paph Albion buds a while back in the "On the Horizon" thread. The second 2 pics are of a Paph tagged Mamie Wilson (lowii x primulinum) but when it bloomed out, it bloomed out as a straight Paph primulinum. It appears the orchidgeeks photo attachment feature has been upgraded! Here's the photos! i think Gold Dogger is a great cross. I'd seen a few of them at shows in the US before moving here to Australia, some wiht the solid red lip like yours and some with a red and yellow lip. i prefer the solid red. The Cattleyas grow in a window. I have another Cattleya in bud and should have pics of it in another 2 weeks or so. Paph Florento (kolopakingii x chamberlainianum) - 3 pics - This guy is a fairly scarce hybrid and (to my knowledge) is the only photo of one on the web. Dendrobium tetragonum var. melaleucaphyllum - 3 pics - I have always loved tetragonums and feel especially privilidged to be able to grow them now here in Melbourne. This is the first plant to bloom of about 12 in bud. also congrats you are the first member to upload the new amount of attachments. Kevin, your paphs are beautiful. When your paph bloom fades, do you remove the old plant after the new one comes up? Do you use sphag in your medium for the paphs to keep them moist? I am in FL and my paphs are inside in A/C. Humidity, lack thereof, is a problem in the house right now. What are your recommendations? How often do you water your paphs in the hot time of the year? The paph I recently bought in bud blasted. Kevin, your paphs are beautiful. When your paph bloom fades, do you remove the old plant after the new one comes up? Hi Chef, I cut the flower stem off once it has dried up but I leave the previously flowered growths alone. The old growths will survive for another 1-3 years and continue to make energy for the whole plant after which it will die off on its own. Do you use sphag in your medium for the paphs to keep them moist? Yup. Also ground peat and if I have it available some coarse sand and shredded oak leaves. This in addition to the regular stuff. I am in FL and my paphs are inside in A/C. Humidity, lack thereof, is a problem in the house right now. What are your recommendations? How often do you water your paphs in the hot time of the year? Melbourne is extraordinarily dry in summer with humidity sometimes less than 10%. Duing these dry times I find it necessary to water my seedlings about every 3 days but they are insmall pots which dry out quickly. A friend of mind waters his every day but he uses a slightly drier mix than I do. My larger Paphs (larger pots therefore more mix to dryout) get watered about every 5 days in the summer. To raise humidity, I actually have a very fine spray bottle mister, almost more like a fogger the mist is so fine. I spray my plants and the glass in my window once or twice a day usually in the morning and in the afternoon. It's always dry by night. I only do that misting think in the hot part of the summer when it is 30+C (about 85+F). I was out of town last week and have been busy this week. One of my budded Paphs dried out too much and the bud blasted. Gotta keep them moist. That could mean watering anywhere form once to 3times a week depending on your conditions. Beautiful pics Kevin!!. Love the 2 Dendrobiums. Great colors and shapes. giant plant in "liitle Shop of Horrors" (Hehe). Audrey II was its name and that's exactly what I thought! Kevin I love all the pictures of your amazing plants. I just bought my first paph along with an odontoglossom I hope I can do them justice. a different spelling or is it suppose to be the same? Kevin, thank you so much for addressing my plethera of questions. I feel a lot better now. I will water much more often. That is probably why my paph blasted. Even with the sphag blanket, I noticed tonight when I came home, they need watering. With the lack of humidity in the house right now, my orchids are starving for water. I need to step up the regime. I tried looking up the var. meleleucophyllum and only found Den melaleucophilum. Is this just a different spelling or is it suppose to be the same? Well Tobi your spelling is closer than mine but I just looked it up and we're both wrong. The proper spelling is: melaleucaphyllum. My spelling was just plain wrong but the spelling you found, the variant spelling of melaleucaphilum, is listed as an obsolete synonym. Thanks for catching my mistake. As you know I'm usually conscientious in the extreme with such things. I've fixed the spelling in my original post. I wonder how many more are going to bloom for you, kmarch. Beautiful collection and beautiful flowers. kmarch: I have a question re. Linnaeus system of naming orchids. While I understand that any name can be given to a species by the discoverer of the species, the name you and Tobi were discussing made me to think if there is a body to correct the mistakes made by 'discoverers' in assigning names. I am not talking about unique names like , possibly, Den. pikevii( ) but something descriptive, like X.vulgaris. If one discovers a new species and names it X.vullgaris would it be accepted? This Den. comes from eastern Australia where it grow as an epiphyte on the Melateuca trees. Thats probably why they chose the var. name as such. I'm sure Kevin can elaborate on this. Thank you Tobi and kmarch. As usual you clarify things so easily.I have not read much in that area and my knowledge is very limited. I will try and read up more before I ask a question. i didn't mean to imply or directly say 'go do your reading' i hope it didn't come across or it wasn't received that way. Oh no.. not at all. I am sorry about the choice of words I used. .May be subconsciously I was a bit self-critical. Thanks very much for all the help in this area. Kevin, I was given a Zip keiki from Kevin Western. The Den. tetragonum really stands out. Here are a couple things that have opened recently. The first is a line bred Dendrobium kingianum, bred for speckles and wildly striped lips. The first pic shows the whole inflorescence, the second, as best I could, a close-up of the striped lip. I love the stunning white of the Blc. The lip's colour is not well captured by the camera and is actually an intense hot-pink. And it's fragrant!!! with such an intense colored lip. I'm assuming it's a mini?